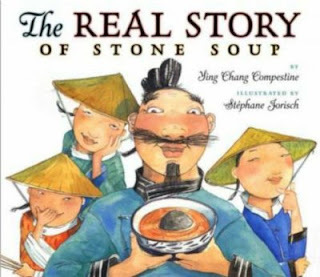 This is a different - but not too different - version of the invention of stone soup. Narrated by the pompous and lazy fisherman, children will soon be giggling as they watch three clever boys outwit him and create the marvelous stone soup. The expressions of the three clever boys and the unsuspecting and clueless fisherman perfectly fit the light-hearted story and the swirling backgrounds evoke the river and surrounding country. The author includes an author's note explaining the origin of the story, and a recipe for " Chang Brothers Egg Drop Stone Soup." Verdict: The text is lengthy and the the humor must be picked up between the text and illustrations, so this is more suitable for elementary-aged readers and listeners. A tricky fox lives in the mountains of Peru. A tricky, hungry fox! Unfortunately for Zorro, Quwi, the plump guinea pig he chases every night, is hungry too - and even trickier! In a series of nightly encounters, Quwi outsmarts the hungry Zorro, who finally gives up. Folktale enthusiasts will notice at least one classic trickster story; trading places in a trap after raiding a garden (at least that's the one I know). The other stories may or may not be familiar. The author's note says these tales are based on a folktale collection from the 70s, with the guinea pig trickster as a mouse. 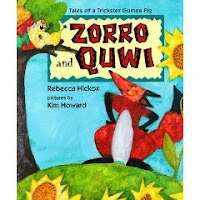 However, the guinea pig as trickster is apparently a familiar figure in Peruvian folklore and his substitution for the original mouse gives the stories an interesting twist. The writing is brisk and segues easily between the different episodes. Hickox has kept the folktale flavor without dating the stories or making them too contemporary. Kim Howard's illustrations are bright and chunky, using big splashes of color and broad outlines. Verdict: This picturebook is a little long for reading aloud to the preschool crowd, although older children might enjoy it. The book is episodic enough to make it easy to adapt individual stories for telling aloud. Plus, it's got a guinea pig! This almost wordless, comic-style, oversized picturebook is a magical tale of a snowman with dreams. Just like the superheroes he reads about in his comics, he dreams of flying....and finally his dream comes true on Christmas Eve. But this is more than a wish-fulfillment/Christmas story. Each panel is an exquisite gem of art, with sly humor and perfect timing. Again and again, Duquennoy turns human habits upside down or gently pokes fun at things familiar to all of us - having a bad day, or even just tidying up in the morning. The artwork is too detailed and lengthy for storytime, but perfect for hours of perusing on your own! Verdict: I love this book, but it's out of print. Sigh. Worth looking for used! 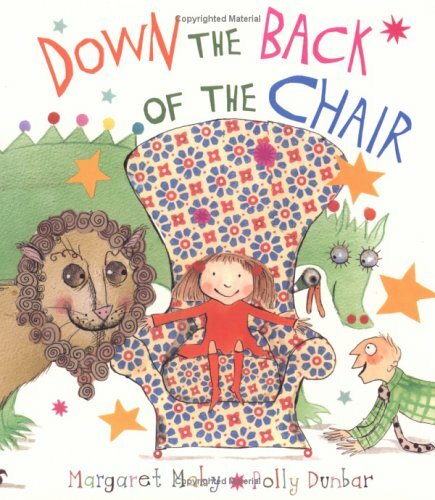 A family's encroaching money problems are solved by delving into the back of a magical chair. This unrealistic plot quickly explodes into delightful silliness as an unending stream of increasingly strange creatures and items are produced from the chair. 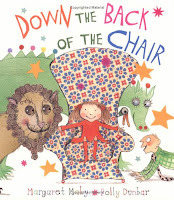 Margaret Mahy's rollicking rhymes are complemented by Polly Dunbar's drawings of a pop-eyed father, exuberant little girl, and a stream of collaged items from the wonderful chair. Verdict: This one would make an excellent read-aloud for storytime kids who like nonsense and addictive rhymes. It would also be a fun start for a storytelling exercise. These two Swedish tales are classic Lena and Olof Landstrom. The deceptively simple illustrations, plot, and characters, are deeply satisfying and reassuring. In each of these two stories, Will has a job to do - get a haircut, and pick up a package from the post office. He doesn't really want to get a haircut, and his package turns out to be ENORMOUS, but he manages on his own and the story comes to a successful conclusion. Will's stories celebrate the simple joys and troubles of childhood, when even small things can loom large, but with a little ingenuity, Will solves his problems! Verdict: I really like these Swedish picture books, but sadly they are out of print. VERY out of print. 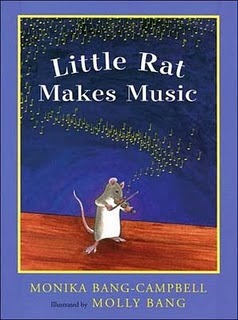 Little Rat loves music and her family is all musical. So she's thrilled when her parents ask if she wants to play the violin....but it's not as she imagined. It makes ugly sounds, it's hard work, and her teacher is really tough. But her family and teacher won't give up on Little Rat, even when she's ready to quit. With some extra tutoring and inspiration, she'll discover the hard work is worth the final result. This easy reader tells a story of music - the difficulties and rewards - with a determined but normal young heroine. Perfect for children who are struggling to get past that initial practicing stage in playing an instrument - or reading! Verdict: This title won't appeal to everyone, but if you have parents who want books about perseverance, this is a good recommendation. Tallulah loves to cook and in this crazy-quilt-color story, she and her friends make delicious pancakes. The instructions are given step by step, with plenty of warnings about safety and cooking tips. There's not really a plot, as the point of the story is walking a child through the pancake cooking process, but the colors are bright and attractive and there are plenty of little accidents to provide humor along the way. 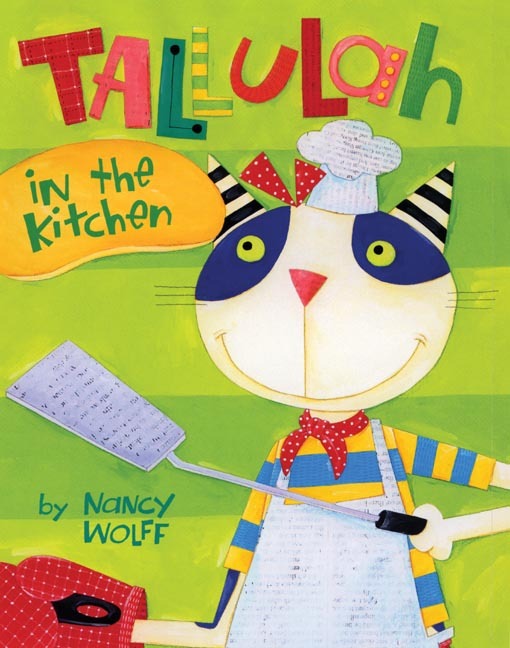 I found the actual recipe difficult to read since it was cluttered in with the colorful art, but I see this is a popular picture book so probably that's just my poor eyesight. Verdict: This book is best suited for caregiver-child interaction, unless you happen to have a stove in your storyroom! In Widget's first story, he's a small, lonely dog with no home. When Widget finds a home, it's not the human he has to convince to let him stay - it's the Girls. Six formidable pussies, who are NOT enthusiastic about letting a dog into their home. But wait! He's not really a dog...or is he? In Widget's second story, the Girls look on disapprovingly as Widget "watches" a puppy. But in the end, Widget, and the Girls, discover how much fun the puppy can be! These simple doggy stories have exquisitely humorous illustrations that won't pass over children's heads. Widget's expressions are priceless and each story has a surprising ending! Verdict: These are great storytime staples for dog and cat themed storytimes and fun for casual reading at any time. This is one of my favorites of E. Nesbit's short fairy tales. Melisande's parents, being modern monarchs, decide to avoid all that christening unpleasantness and christen the baby themselves.....but do-it-yourselfers often run into trouble and kings and queens are no exception! They find themselves faced with an angry mob of fairies and only the king's logical reasoning gets them out of a nasty situation. Unfortunately, when it's all over, little Princess Melisande, although sweet and good and lovely, also turns out....bald. Not to worry, the king has a useful wish stored away; but it doesn't work quite as expected. 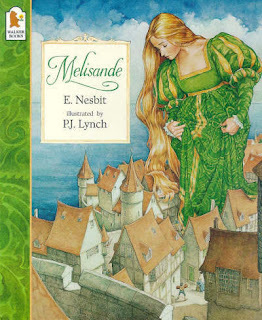 It takes a handsome prince, several tries, and a lot of mathematics before Melisande can settle down to her happily ever after. P. J. Lynch's gorgeous illustrations are the perfect complement for this logical, nonsensical, and fantastical fairy tale. Verdict: This picture book is too long for the average storytime read-aloud, but older children who like fairy tales might enjoy listening to it. It's abridged. To get the full flavour of Baum, you need to hear all the sly jokes, nonsensical little details, and solemn moral pronouncements. 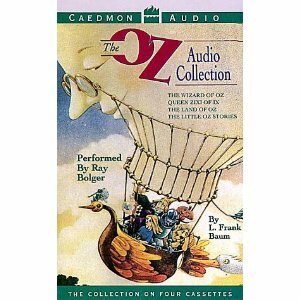 Ray Bolger was a fun scarecrow in the movie, but he's not a good narrator. His Jack Scarecrow sounds like he's talking through a mouthful of pumpkin pie and he gives a horribly racist accent to the pawnbroker in Little Oz Stories. And why pick Zixi of Ix and Little Oz Stories? 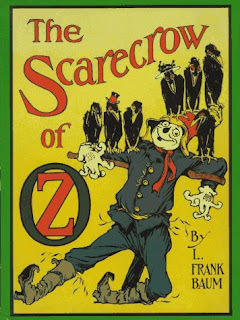 These are definitely not the best of Baum's writing, especially Little Oz Stories which breaks most of the rules for Oz fantasies by sending the characters to America. In addition, it's heavy on social commentary without Baum's normally humorous slant. I read it from beginning to end. I read it from end to beginning. It didn't make any difference. It's all dialogue and no plot. However interesting a book which can be read backwards is, one still wants something to happen. Verdict: A historical curiosity perhaps, but disappointing all the same. One of our newest, favorite books at the library is Caroline Jayne Church's Ping Pong Pig. This is a silly and delightful story of a pig who dreams of flying. His attempts to fulfil his dream exasperate and cause problems for all the other farm animals, who finally come up with a solution to keep Ping Pong Pig out of their respective way and away from their work. Ping Pong is delighted...until he realizes how hard everyone else is working and that he is not contributing anything! So he figures out how to help out; and still keep his dreams. We've enjoyed this in several storytimes and it's popped off and on the new shelf regularly. So, I thought I'd take a look at a few other of Caroline Church's picture books. Of all the flock of geese, one little goose just doesn't fit in. He's so...dirty! But then the other geese realize there might be a good reason for this....Church doesn't stop there, though, with what might have been a rather tired plot. Nope. Smart Goose is definitely a clever goose and although it takes him a while, he finally wins a place in the flock. While I am quite partial to geese and Ping Pong Pig's delightful roundness makes him a favorite, I think Digby is the funniest. Digby is the new sheepdog. He knows he's good at his job and he's ready to do his best...but the sheep won't cooperate! Everything he tries, getting progressively sillier and more desperate, just makes the sheep (and the reader) laugh harder. Finally, the cows and pigs let him in on a little secret....but it doesn't work on everyone. Verdict: Church's illustrations have a homey, not too cute but endearing style with delightfully shaped characters and enjoyable colors. Perfect for reading aloud to toddlers and preschoolers, these stories have just enough repetition to hold the younger children's interest with plenty of humor for the older listeners. 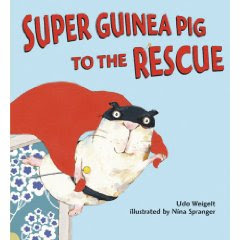 The story's not too bad, a little didactic, but ok. A guinea pig learns that his fellow pets, a dog, goldfish, and canary, are his best friends, not an imaginary character on tv. But the pictures are just...wrong. All the animals look like they are in an advanced state of mold, except the goldfish, which looks like it has a serious case of mumps. Now the dog is believable, I've seen dogs with that coloring, although I didn't think they were particularly attractive, but that's besides the point. But the canary looks like someone splashed it with paint and then stored it in a cellar to dry and something went....wrong. And the shape of the goldfish makes one wonder if it's really alive, or actually dead and stuffed...badly. The guinea pig is the WORST. It looks more like a sloth (mold in the fur, you know?) or maybe really, really dirty. It's a weird shape - guinea pigs don't take well to standing up and waving a sword around - and its eyes are all wrong, as you can see in the picture. Guinea pigs have black, shoebutton eyes. 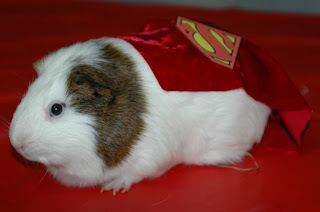 Let us refresh ourselves with a REAL super guinea pig from the Texas Rustlers Guinea Pig Rescue. Verdict: The illustrations were so painful. I don't recommend even looking at this book if you can avoid it. 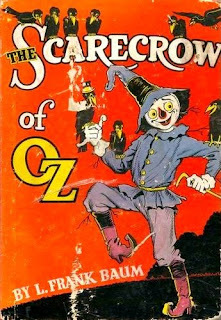 The Scarecrow of Oz, while not the best of Baum's Oz books, nevertheless contains some unforgettable characters. Of course, Trot, Cap'n Bill, Button-Bright, and the great Scarecrow himself are favorites. But this particular volume introduces such unforgettable personages as the featherless Ork, with his propeller tail, the Bumpy Man who lives in the Land of Mo, and the romantic Gloria and Pon. While these characters are memorable, the story is weak in the classic plot of strange characters and countries encountered while traveling. The only traveling in Oz, after the problems of Gloria and Pon have been solved, is made quite fantastically luxurious by the Wizard and the Scarecrow's little mishap seems to be an afterthought. Verdict: It's worth reading for the dedicated Oz fan, and those not in love with all things Ozzy will find it worthwhile to read about the strange Ork and the magical Land of Mo. If your library collections Oz books, go ahead and add it, but otherwise it's not one you need - stick to the first three Oz titles for your basic collection. I'm rather fond of the MGM Chitty Chitty Bang Bang film, although there are several "The Song We Sing Like This" type of numbers. However, every time I've tried to read the actual book by Ian Fleming, I've found it trite, silly, outdated, and just impossible to read. I have now discovered the secret....you have to LISTEN to it. It makes a marvelous story when read aloud, sounding exactly like a father telling a story to his children and making it up as he goes along. The repetitive language and cringeworthy asides sound perfect out loud, like someone stalling for time to decide what to say next. 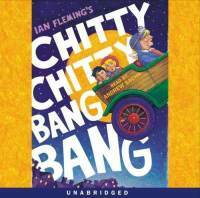 The unabridged version I listened to was narrated by Andrew Sachs. Verdict: I really enjoyed listening to this, and will probably listen to it again in the future, but I wouldn't recommend purchasing it for your library unless you have a large number of fans of the movie.